Seafood allergies are the most common food allergies They occur when someone's immune system mistakenly interprets proteins contained in fish such as anchovies as a harmful substance, according to The Online Allergist, a website written and edited by Board-certified allergists. Symptoms of fish allergies are similar to symptoms of other food allergies and affect the digestive system, skin and respiratory system. Anchovy allergies can be especially problematic because anchovies are "hidden" ingredients in other foods, such as Worcestershire sauce, Caesar salad dressing and Bloody Mary cocktails. Atopic dermatitis, also known as eczema, can appear as a rash on the inner forearm, the elbows, ankles and wrists, behind the knees, and on the face, neck and chest as a result of allergic reaction to seafoods like anchovies. Children with a fish allergy can get eczema patches on their eyelids, palms of their hands and soles of their feet. Skin testing can help confirm what food is triggering the allergy as can a food challenge, which involves feeding a food suspected of causing a reaction to see if it results in allergy symptoms. Urticaria, commonly known as hives, present as red, swollen, itchy welts on the skin. Hives are an allergic reaction of certain people's skin to a substance or food ingredient that is harmless to most individuals. Foods such as anchovies that are rich in histamines can cause a chemical reaction that results in hives in sensitive people. Hives may appear suddenly and usually last only a few hours, although occasionally they can remain for more than six weeks. Anchovies are a histamine-rich food that can trigger an allergic response such as allergic asthma, according to the Michigan Allergy, Sinus and Asthma Specialists. Allergic asthma is an airway obstruction and inflammation that may be partially reversible with medication. Allergic and non-allergic asthma have similar symptoms, such as coughing, wheezing, shortness of breath and chest tightness. The most dangerous fish allergy symptoms affect breathing and may cause a drop in blood pressure resulting in shock, known as anaphylaxis, which is the most severe type of allergic reaction. The Asthma and Allergy Foundation of America explains that food allergies are the leading cause of anaphylactic reactions treated in U.S. emergency rooms. Seafood allergies are the most common causes of food allergy and can be lifelong. Anaphylaxis affects the whole body, causing widening blood vessels precipitating a drop in blood pressure, flushed skin, rash, swelling of the lips and nasal passages, sweating, pallor, nausea, abdominal cramps, rapid pulse, confusion, wheezing, convulsions, lightheadedness and fainting. 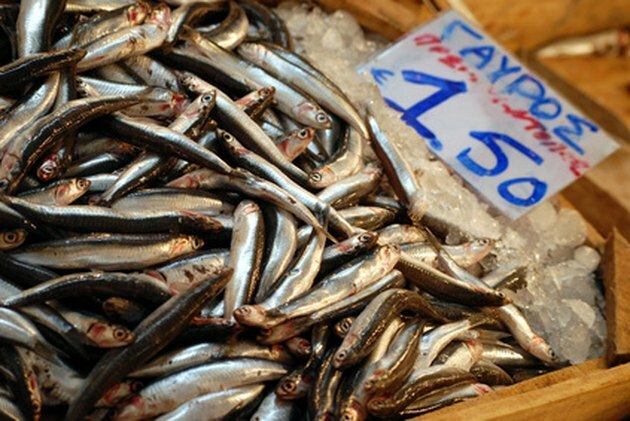 Allergic reactions to anchovies typically occur when the fish are eaten, with severe reactions generally starting minutes after ingesting the food. Some people experience digestive distress, including stomachache, cramping, diarrhea or vomiting. Other people's symptoms are triggered when fish protein from the anchovy is inhaled during the cooking process or when the fish comes into direct contact with an allergic person's skin. Seafood allergies last throughout people's lives, unlike most food allergies that children grow out of. Women are more likely to be afflicted with fish allergies than men, and it is not uncommon for the onset of fish allergies to happen in adulthood, according to the The Online Allergist. People who have food allergies must be careful about everything they eat, especially if they are allergic to anchovies and other ingredients that may be a hidden in different foods. Reading labels can be life saving. The Federal Food Allergen Labeling and Consumer Protection "requires that any packaged food product that contains fish as an ingredient must list the name of the specific fish on the label." Do Seafood Allergies Cause Stomach Cramps?